Present at the viewing: Paul Howell & sons Jonathan and Benjamin; George Whitney, Joan Chamberlin, George Bokinsky, the Owners of the property where we set up, Betty & Joe Piccicinni & this author, KM Rogers. We traveled to Cornish at a site Betty indicated is one of the highest points in York County, Hosac Mountain. George had made up his mind that he was going to image the transit of Venus with his Coronado Hydrogen-alpha filter at sunrise on June 8th. To this end we started thinking about the where and why of this, how the ‘expedition’ should be equipped along with all the other details these events entail. He asked me early on as he knew I’d be interested in this as well, and fortunately, Paul had his recent semester completed before the date so he planned to join us as well. I don’t need to inform (or remind) any of us about the poor stretch of weather we’d encountered in Maine over the past several months… As the June date crept closer we continued to experience bouts of rain and overcast that had us all concerned. So, alternate sites were considered - the Eastern Shore of Maryland, Cape Cod, Massachusetts, somewhere in Nova Scotia, to name several besides various local alternatives. Collectively we decided to ‘keep it simple’ and stay close to home and were investigating a site in Cumberland. The Transit would be underway before sunrise at our location; nearly half completed before we could even begin to view let alone image it. The only way to have an opportunity to image this event would be to have the imaging mounts set up, aligned and ready the night before. So we loaded the vehicles and waited to determine where the best place to locate may be. As June 7th came, the forecast projection wasn’t too promising and the June 8th satellite maps indicated a band of cloud cover not expected to disperse over our target site. Upon review of available information we talked it over and predicated upon the satellite images, decided if we could get into Standish or near that area we may possible escape the clouds. By happenstance, Joan (Chamberlin) emailed me at just about that exact moment and I returned the correspondence asking her to call George immediately. She did and an exchange was forthcoming to look for a site with a northeasterly horizon in her home location. It must be stated here that Joan succeeded in this site choice beyond our greatest expectations… After re-connecting with all parties we headed out Route 25 through Westbrook on our way to a hilltop in Cornish. We met Joan and her neighbor Bruce at the Bay Haven Restaurant. In the end result, Bruce served as our guide to the observing site as he’s friends with the Owners of the selected site, Joe and Betty Piccininni. Paul stopped nearby at a pizza place to feed the boys and we sat in the restaurant and talked for a bit while everyone had some dinner. It was nearly 8:00 PM and as the restaurant closed at 9:00 PM, any thoughts of coming back to town after the set up for a more leisurely meal was forgotten. Cornish, were we met, isn’t exactly a booming metropolis and whatever we needed to get through the evening had to be picked up now. Up Hosac Mountain we went and we parked and introduced ourselves to our hosts. Joe and Betty were extremely nice folks we found although I’m certain they questioned our sanity when we indicate we’d be sleeping somewhere near the equipment that night. The Sun was setting when we backed up and started the set up process and it was well into darkness before we completed and did a polar scope alignment on the mounts in-between the clouds. During that time cloud cover rolled in and out several times and fog from the valley below started the upward creep that eventually engulfed our two Astro-Physics mounts. Mosquitoes and other biting hellions continued to swarm and harass us throughout this period, all par for the course I’m afraid. Around 11:00 PM or so we were joined by Dr. George Bokinsky who came driving up… we couldn’t believe he could find this place, we didn’t even know where we were. Joan who had since gone home to get some sleep had provided George excellent directions so we welcomed him to our group. He set up a lightweight mount as he planned some film images at sunrise with a white light filter. Shortly before midnight we covered the equipment to keep the dampness out and went to our perspective vehicles to get some sleep. George had an alarm clock and was delegated to wake us up at around 04:30 hours so we could check the conditions and finalize our camera set up if the morning looked promising. Our wake up call came and the area was full of activity. Betty had kindly brewed up some coffee and as we viewed the morning light previous to sunrise we had an opportunity to enjoy the beautiful setting we found ourselves in. The clouds and haze was distinct in the valley below as we watched the horizon for the first break indicating the rising Sun. The vision was spectacular as the Sun arose from the midst and trees; it was a shame we didn’t have a point and shoot camera to photograph this event, but we had last minute preparations to make as the CCD cameras weren’t quite ready. We used the waning Moon to focus the ST-2000XM and I installed the solar filters and turned it to the Sun. When Paul went to power up his STL-11000 he learned he had the wrong power supply for the camera. He quickly constructed a cord, energized the unit and commenced the focus process with George, not a simple task with the Hydrogen-alpha filter in place. At some point during this time Joan called trying to glean a weather update from the site. It was overcast at home and she thought the viewing would be a wash. However, Betty told her the view was outstanding and to hurry along as we were preparing to image. I had the FS-78 set up with a diagonal and a 40mm eyepiece and the first views of the shadowy planet across the Sun’s disk were found to be magnificent. Everyone came by and took a look between tasks as the sight was so unusual and the reason we were up so early. I don’t know how many of you have ever watched the sunrise for any length of time, but it really didn’t take long at all for the entire disc to break the cloudy surround of the horizon on this beautiful morning. So quick in fact, we started lagging behind in our efforts to get prepared and start imaging. The ST-2000 was ready and George and Paul final checked the Maxim DL computer set up to make certain everything was prepared to start the sequence shooting with the red filter. Once this was checked the computer/camera combination took over and we started to compile images. I was watching the information dialog box to make certain the pixels didn’t over saturate and create an overexposure. Over the course of the next several hours this was corrected on several occasions and we had to re-center the telescope due to refraction as the Sun broke out over the horizon. As the Sun got higher changing the exposure time became more frequent to the point where several sections of cardboard were hastily put together to form a mask to limit the amount of light entering the OTA. We increased the exposure times as third contact was imminent hoping to catch any ‘black drop’ effect should the camera pick it up. Before the end of the transit, 159 exposures were logged from this camera. We continued to monitor the event visually through the FS-78 and all agreed this was a really enjoyable experience. The transit finally ended and we milled about getting ready to break down the equipment and head off to work or whatever. Were we successful? Well, I’d say we were. Take a look at the two finals on this page processed from the many images we shot that morning. Here is a larger view if you care to look, the first was with the ST-2000 and a Baader filter: Transit in White Light The second, processed and enhanced by Paul, is (in my humble view) magnificent: Transit in Hydrogen-alpha. 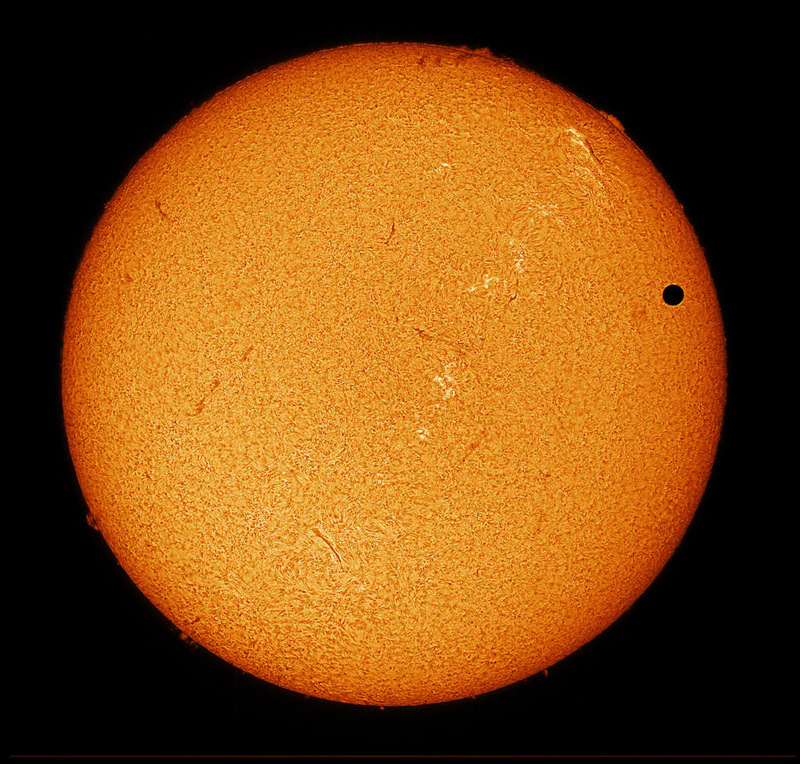 Follow up: The Transit image in Hydrogen-alpha has been published at least twice, Sky & Telescope's October '04 edition and Skywatch '05, an annual magazine; it was also entered on the Astro-Physics gallery of exceptional images taken with their refractors.